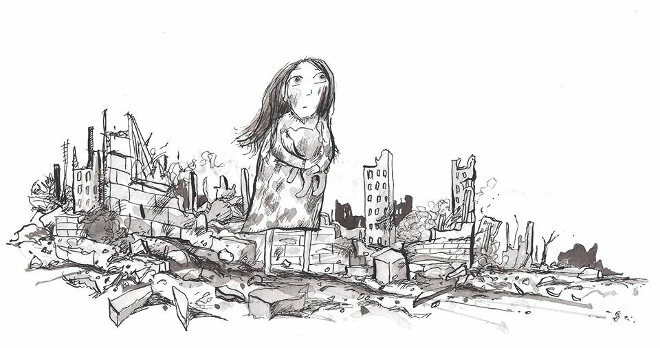 For this week’s writing prompt I invite you to write a piece from the point of view of this little girl, then a piece from the point of view of someone who believes those bombs should be dropped. Try to remain detached and objective as you write each piece, but give your characters all the emotions that seem appropriate. If you are able, make the two have a conversation, and see what rises to the surface. Find more of Stu’s artwork at www.stumclellan.co.uk. If you write something prompted by this idea, please send an email to Judy(at)socket creative.com to let me know. With your permission, I’d love to publish it on SkyLightRain.com.